Two best-friend chefs electrified L.A. with their outrageous cooking and built a food empire. Now what comes next? THE FIRST THING to know about Jon Shook and Vinny Dotolo is that for all intents and purposes they are two halves of a single brain. Yin and yang. McCartney and Lennon. Cheech and Chong. There is no precise comparison that captures the breadth of their bromance, but suffice it to say that they have spent nearly as much of their lives together as they have apart. Raised on opposite coasts in Florida, the chefs behind Animal, Son of a Gun, and Jon & Vinny’s met 19 years ago on their first day of culinary school in Fort Lauderdale. They’ve remained inextricable ever since. After the two relocated to Los Angeles in 2002, Dotolo applied for a line cook gig at Govind Armstrong and Ben Ford’s erstwhile Beverly Hills restaurant, Chadwick, telling Ford at the interview’s conclusion that his buddy would have to come along, too—they were a package deal. Ford hired them both. Their brotherly relationship is uncommon in the restaurant industry, at least in sheer duration. The intense physical and mental strain of the business has a way of grinding down even the most productive relationships (the decades-long feud between Jeremiah Tower and Alice Waters of Chez Panisse that started in the ’70s might be the most infamous example). Stir in contentious financial decisions, booze, and drugs—all rampant in the industry—and the potential for combustion can be inevitable. Except with Shook and Dotolo. Their first venture, Animal—the sparsely decorated dining room on Fairfax that became famous for selling baroque foie gras biscuits and fried pig’s ears—celebrates its tenth year this June, a length of time that might as well be a century in restaurant years. The pair’s catering operation, Carmelized Productions, has become the de facto vendor of choice among the Hollywood elite. 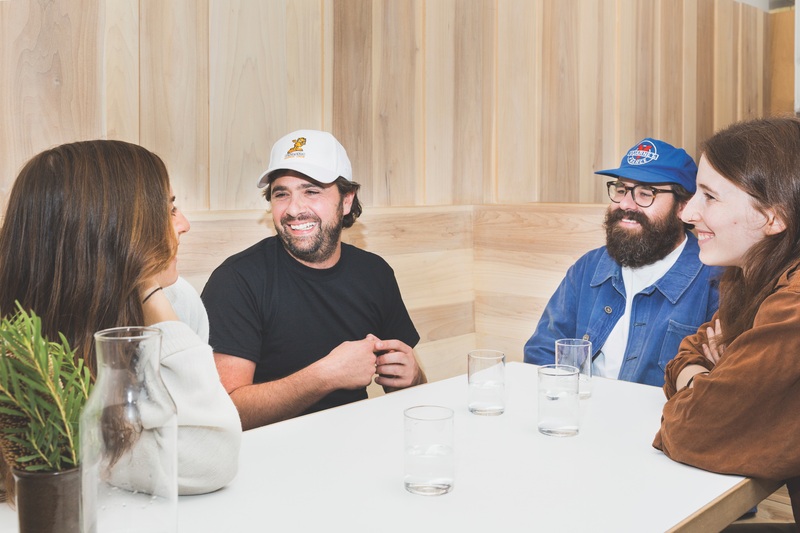 Their hospitality group, Joint Venture, encompasses seven dining rooms, employs 250 people, and has partnerships with chefs Ludo Lefebvre as well as Sara Kramer and Sarah Hymanson. Their flagship Italian American diner, Jon & Vinny’s, has the broad appeal to evolve into a national restaurant chain. The future appears bright. But as their nascent food empire expands beyond their direct control, the boyish masterminds have begun to grapple with the question every budding entrepreneur faces: How do we not screw this thing up? The boyish masterminds have begun to grapple with the question every budding entrepreneur faces: How do we not screw this thing up? 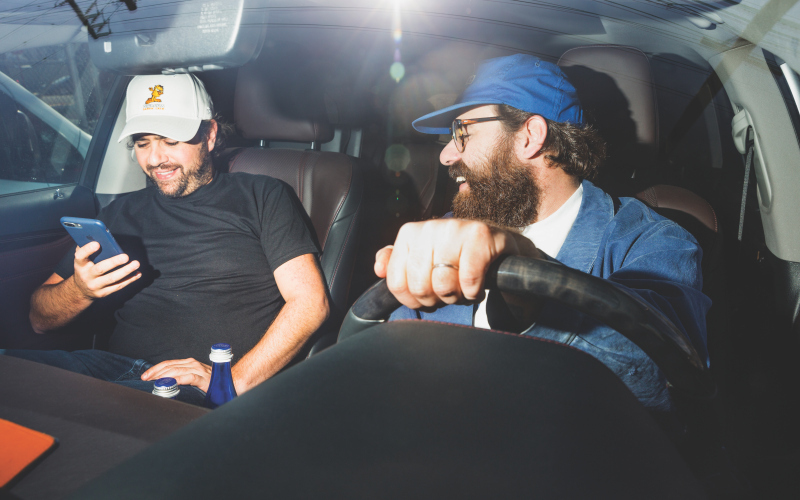 Shook and Dotolo arrived in L.A. as a pair of scruffy surfers with $500 between them. (After stints in Miami and Colorado, they’d grown accustomed to squeezing by on a line cook’s pay.) The two had envisioned moving to San Diego, where they could ride killer swells, but Shook had an aunt who lived in the Valley who could provide a temporary place to crash. Working in Beverly Hills under Ford led to catering gigs, some for his father, Harrison Ford, and his then-stepmother, screenwriter Melissa Mathison. When they weren’t cooking they’d paint houses and do odds jobs for Mathison and her friends. Their charm was hard to resist: scrappers with boundless enthusiasm, goofy grins, and a rare talent for throwing together glorious meals on the fly. Shook recalls cooking a dinner for a producer in Malibu, then spending the night on his couch so that he and Dotolo could hit the beach the next morning. Amassing a stable of Hollywood patrons, their operation began to attract media attention—they coauthored the cookbook Two Dudes, One Pan and starred in a Food Network reality show called 2 Dudes Catering. Their wavy shoulder-length hair, hazy surfer lingo, and general Spicoli vibes made them prime candidates for reality TV in the age of Jersey Shore. The show lasted five episodes. “The network wanted us to be these outrageous characters, like getting into crazy fights and stuff,” says Dotolo, “but it wasn’t who we were.” Since then they’ve appeared as guest judges on shows like Top Chef and Iron Chef America, but their early foray into television left them wary about being on camera. “We wanted to focus on what we loved doing, which was cooking,” says Shook. “Vin’s got the mind of an elephant. He remembers everything,” his business partner, ever the good promo guy, tells me more than once. Thirty-six and around the same height as Dotolo, Shook usually sticks to black T-shirts, shorts, and slip-on Vans. He possesses an unruly mop of dark hair, a stubbly beard, and a high level of what neurologists often refer to as “executive function,” a skill set rooted in the frontal lobe that enables him to multitask with rigorous efficiency. Chatty and jocular, he’s prone to sly bouts of boosterism as he flits between topics. If Dotolo is the deep thinker, Shook is the quick thinker, P.T. Barnum with a sauté pan. He seems to exult in the bureaucratic, often mundane tasks that so many other chefs bemoan, like dealing with janitorial services, sprinkler systems, and takeout packaging. “I love cleaning. I love sanitation. I love wearing rubber gloves,” he tells me earnestly after I watch him swipe a finger around the dining room at Animal, hunting for dust. After flying to Colorado Springs to cook a Lexus-sponsored dinner at the historic Broadmoor hotel, Shook returned in awe of the industrial efficiency of the kitchen facilities, already thinking of how to apply it to his own organization. 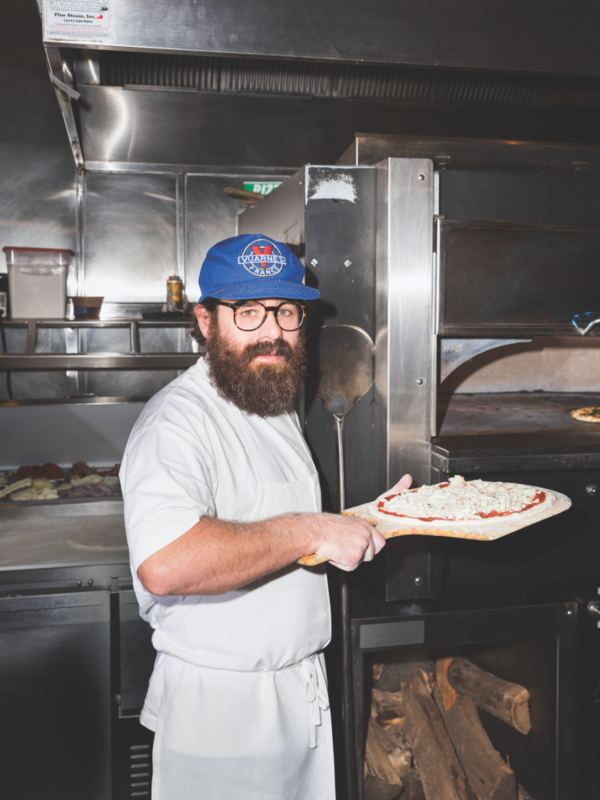 IT’S LATE MAY, and Dotolo is standing in the parking lot, flipping through emails on his phone outside Trois Familia, the French-Mexican brunch counter he and Shook operate with Ludovic Lefebvre in a Silver Lake strip mall. Like most days, the chef is on a tight schedule. He’s here to sample a couple new dishes, but Trois Familia’s chef de cuisine, Gary Miller, hasn’t set up the mise en place yet. Dotolo shakes his head in frustration before seeking some shade to work on a can of LaCroix, his favorite drink (“I’ve been trying to get them to sponsor him!” Shook tells me later). 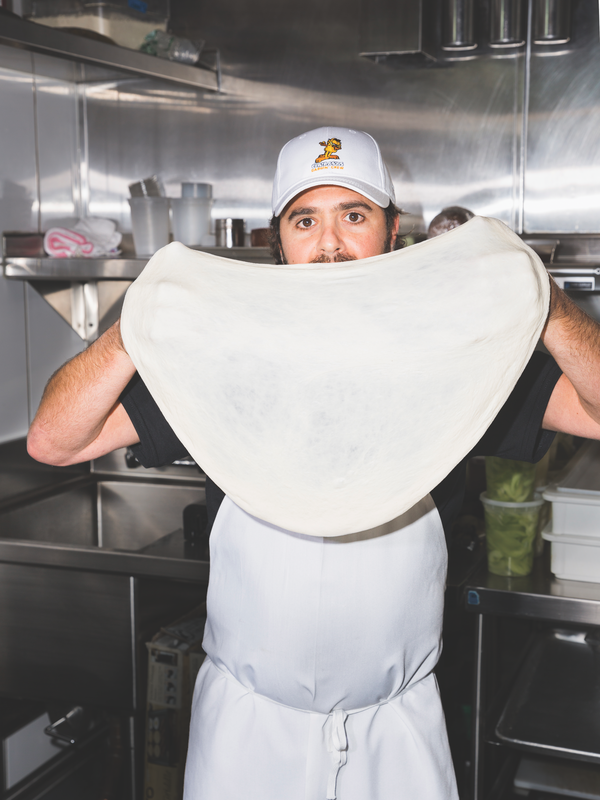 Even for a professional chef, Dotolo exhibits an unusual fanaticism for ingredients and techniques, whether refined or mass-market. Animal once featured a bowl of unadorned peak-season mulberries as dessert; Son of a Gun’s famed fried chicken sandwich was part homage to Chick-fil-A. At a guest dinner with English chef Fergus Henderson last year, Dotolo coached line cooks glazing herb-marinated quail by describing the grilled chicken at Dino’s Chicken & Burgers on Pico. It’s tough to pinpoint the exact origin of dining trends, but few chefs can claim the broad influence Shook and Dotolo have had on modern food culture. Before Animal debuted in the summer of 2008—five months before Roy Choi’s Kogi BBQ truck first hit the pavement—terms like “dude food” and “stoner cuisine” were not part of the city’s lexicon. Shook and Dotolo’s bombastic, cross-cultural, and offal-heavy cooking at Animal netted them a Food & Wine Best New Chefs Award in 2009 and an overdue James Beard Award for Best Chef(s) in 2016. At Trois Familia, the kitchen is finally ready, and Dotolo heads in to tinker with a dish of chilled asparagus tossed with lime dressing—a stark departure from the current menu of churro French toast and whipped potato tacos. Among the asparagus’s garnishes are wafers of lemon cucumber, chopped pistachios, and pink pickled onion. Could it use fresh mint? Should the pistachios be chopped finer? A few years ago, Dotolo, a self-lacerating perfectionist, might have agonized over such decisions hours before service, but now he’s content to send the ideas to Lefebvre for more back and forth (most dishes at Trois Familia are created via a loose collaborative process). They’ll test the next version when Dotolo and Shook return from a trip to Tulum in Mexico, but in the end, the dish doesn’t make the cut. SHOOK IS ON a call—he’s always on a call—discussing a space they’re building in Sherman Oaks as he slogs through traffic along La Cienega in Ladera Heights. He prides himself on being something of a lease whisperer, sussing out strip mall vacancies like the former Raffallo’s Pizza in Hollywood that became Trois Mec, the modish tasting-menu restaurant Shook and Dotolo opened with Lefebvre in 2013. The following year, around the time they were developing the idea for Jon & Vinny’s—a place built on Italian American crowd-pleasers like linguine in clam sauce and meatballs with garlic bread—they opened Petit Trois, Lefebvre’s throwback French bistro, in a former Thai restaurant next door to Trois Mec. “Nobody can negotiate rent like Jon,” Lefebvre’s wife, Krissy, tells me. “He has a gift.” That knack for bargain hunting, Shook believes, has been paramount to their success. Carmelized Productions’ clients, for the most part, tend to be well-off patrons or businesses with generous expense budgets. The company is a preferred vendor for Yifat Oren, the coveted Hollywood party planner who has worked with everyone from Adam Levine to Natalie Portman. Other regular clients include not only the celebrities you’d expect, but also the power players behind them—studio heads, power agents, investor types. In the commissary’s front office, two large whiteboards map out upcoming events, among them an art gallery opening, a bat mitzvah, and a movie premiere. Some are booked days in advance; others require months of planning, like the pop-up restaurant Shook and Dotolo operated at three consecutive Sundance Film Festivals (rather than rely on local distributors in the harsh Utah winter, they filled trucks with produce from the Santa Monica Farmers’ Market each time and shipped everything across state lines). Their first chef-partner, Frenchman Ludovic “Ludo” Lefebvre, moved to L.A. from Paris in 1996 to run L’Orangerie in West Hollywood. By the time he moved to Bastide on Melrose Place, he was known for being one of the most talented and temperamental chefs in L.A. But it wasn’t until Lefebvre launched the wildly inventive pop-up dinner series LudoBites in 2007 that he became a star, earning a short-lived TV show. Shook and Dotolo attended Lefebvre’s earliest pop-ups and became friends with him. (“Not friends like we go out every weekend, but we’d see each other at restaurants and have a drink,” Lefebvre says in his Burgundy accent.) What was remarkable to them was that Lefebvre didn’t have a permanent place. It wasn’t for lack of trying. At one point, Lefebvre and his wife had nearly opened next to Valentino in Santa Monica, but investors pulled out when the French government criticized George W. Bush’s invasion of Iraq. “Nobody wanted to put money into French food after that,” Krissy Lefebvre says. 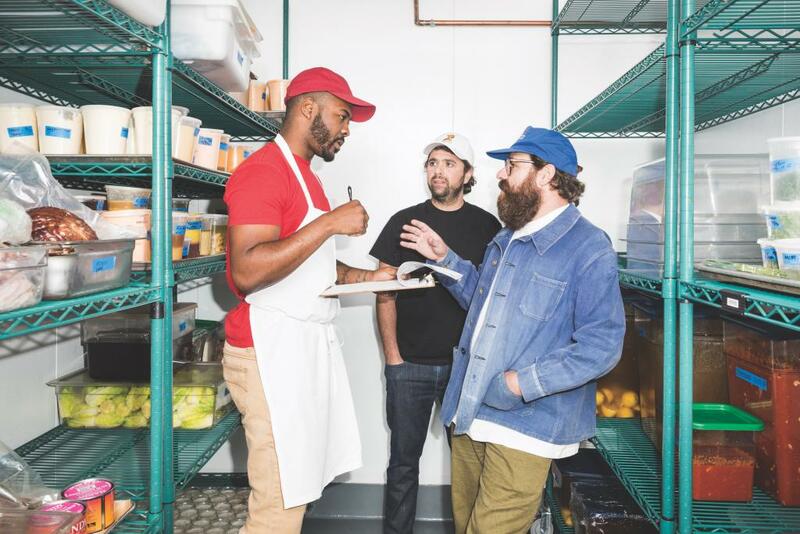 During a foie gras-themed dinner at Son of a Gun, which took place weeks before California’s ban went into effect in 2012, Shook and Dotolo approached Lefebvre with the idea of partnering. For his part, Lefebvre remembers thinking, “Why not have successful people to work with?” Their original plan was to launch a fried chicken joint, but inspired by a subsequent trip to Copenhagen, they settled on offering an avant-garde tasting menu that, priced at $75 per person (the cost is now $110), would focus on European technique while winking toward globalism. The name was easy. Trois Mec. Three dudes. More difficult was figuring out how to fit three chefs into one tiny kitchen. They considered running the place in shifts: Lefebvre would cook for four months, then Dotolo, then Shook. But as Shook and Dotolo’s schedule pulled them in other directions, they struck a compromise. Trois Mec would become Lefebvre’s restaurant; Shook and Dotolo would provide operational input, developing recipes as needed, and share in the profits. The decision paid off, and the concept—it was the first place in L.A. to sell “tickets” rather than offer traditional reservations—proved a critical hit. In 2014, the trio opened Petit Trois, a narrow bistro serving escargot and steak frites, whose essence was pure Lefebvre. Then came Trois Familia in 2015, which they plan to expand into a late-night wine bar in the coming months once the license is approved. And this year they’ll open a Petit Trois in Sherman Oaks that will seat 90—their largest restaurant yet—and feature Lefebvre’s take on upscale brasserie cuisine, like duck à l’orange and beef bourguignonne. 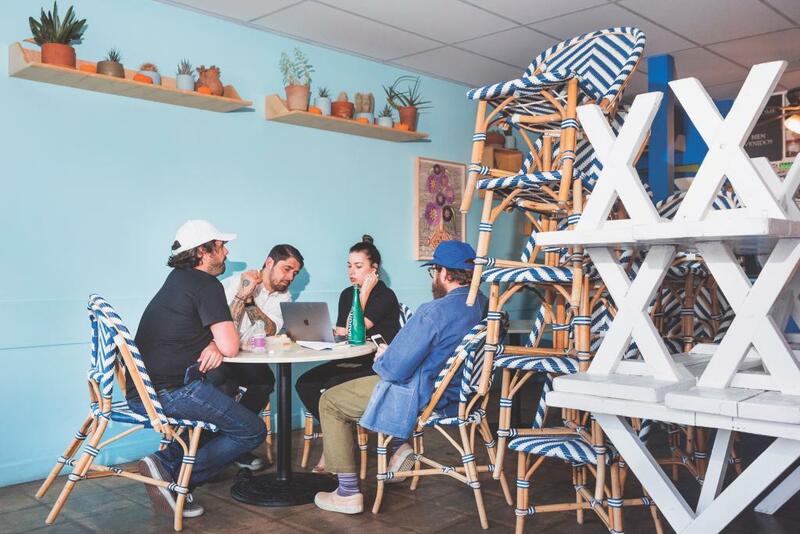 With Shook and Dotolo acting as “operational partners”—a similar arrangement to Lefebvre’s—Kramer and Hymanson opened Kismet, an airy all-day Mediterranean restaurant in Los Feliz, last January. Kramer and Hymanson had final say over everything; it was their restaurant. “They know that with some decisions we’ll be right and sometimes we’ll be wrong, but they want us to figure that out for ourselves,” says Hymanson. “They’ll give us their opinion, but they don’t want to impose too much.” She and Kramer already have plans to open a new takeout project with Joint Venture next door to Kismet later this year. SHOOK AND DOTOLO have a keen interest in both scouting talent and nurturing it. Alumni of their kitchen include Jonathan Whitener (Here’s Looking at You), Miles Thompson (Michael’s), Ryan Denicola (Chi Spacca), and a handful of bartenders who’ve trained under Joint Venture’s longtime beverage director, Helen Johannesen (she now owns a wine delivery service and bottle shop in the rear of Jon & Vinny’s). There’s Sam Rogers, a former delivery clerk who serves as Joint Venture’s full-time farmers’ market liaison (buying upwards of 40 dozen fresh eggs a week); catering co-chef de cuisine John Clark, a former Museum of Tolerance security guard from South L.A.; and Jon & Vinny’s chef de cuisine, Courtney Storer, who has emerged as one of the group’s rising stars. THE PURSUIT FOR Shook and Dotolo has, all along, been to create food that’s accessible without sacrificing quality or distinctiveness. They’ve built a career blending high and low culture without making it feel middlebrow (Shook describes it as “casual luxury”). If their embrace of everyday dishes has been a defining note in the tuna melts and fish and chips of Son of a Gun, it is Jon & Vinny’s reason for being. When Shook and Dotolo conceived of the restaurant, they envisioned a place that would serve throughout the day, a huge challenge in terms of cost and logistics. The food—pizza, pasta, chopped salad, meatballs, mozzarella sticks—would be familiar (and kid-friendly) but refined. So far the response has been overwhelming, spilling into their catering business. At large events Shook now rents a dozen deep fryers and boils water in them to produce mass quantities of fettuccine; meatballs are rolled by the thousands. The mere mention of it gets Shook buzzing. The stakes are especially high because they’ll be renting from L.A. real estate magnate Rick Caruso, the developer behind the Grove and the Americana at Brand. Shook tells me he hates the word chain, yet it’s obvious they’re aiming to build something that can go beyond two locations. Not that they’d reveal their plans (“never bring your cheese to the rat trap” is Shook’s media policy). But the idea of multiple branches would seem to have undeniable appeal to people with their grand vision. More Jon & Vinny’s outlets would mean lower costs, a hurdle that all restaurateurs struggle with, and greater access to capital, which could be used to finance concepts for up-and-coming chefs they’ve partnered with. “It’s a tough industry,” Shook says. “The system is broken, and nobody has found the solution yet.” Maybe going mainstream, for lack of a better term, could provide the answer.